The Laguna large Art Deco style flush 3 light fitting in copper finish, a superb quality Renaissance style light, supplied by Elstead Lighting and designed by Quoizel. The Laguna Art Deco styled three-light flush ceiling fitting, with a large classic brushed black and copper circular ceiling mount and central taupe mica shade encased in a wire frame, surrounded by a band of shimmering copper mosaic tiles. Fitted with an etched lower diffuser and matching finial for a softer downward glow. 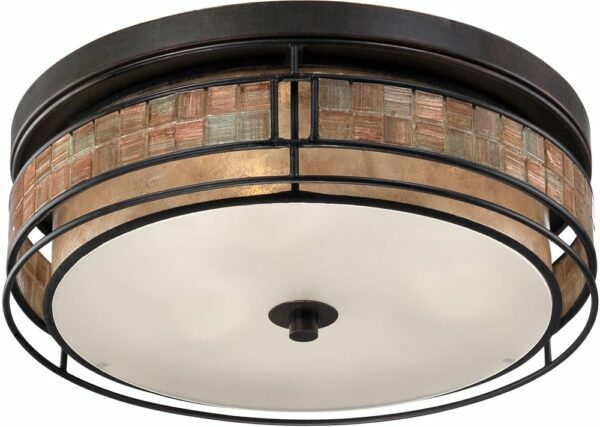 An Art Deco style ceiling light featuring shimmering copper mosaic tiles. Choosing a light to complement the Art Deco themed room with a lower ceiling couldn’t be easier than this.